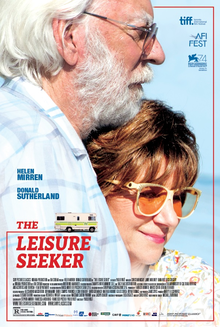 The Leisure Seeker is a 2017 comedy-drama film directed by Paolo Virzì, in his first full English-language feature. The film is based on the 2009 novel of the same name by Michael Zadoorian. It stars Donald Sutherland and Helen Mirren, acting together for the first time since the 1990 film Bethune: The Making of a Hero. It was screened in the main competition section of the 74th Venice International Film Festival. Mirren received a Golden Globe nomination for her work in the film. Traveling in a vintage Winnebago recreational vehicle, John and Ella Spencer take one last road trip from Wellesley, Massachusetts to the Ernest Hemingway House in the Florida Keys before his dementia and her cancer can catch up with them. The film reunited director Paolo Virzì with producers Fabrizio Donvito, Benedetto Habib, and Marco Cohen from the Indiana Production Company, since their collaboration in Human Capital and Like Crazy which also won many festival awards. It is also the director's first film shot solely in English. Sutherland and Mirren had previously collaborated as a married couple in the Phillip Borsos directed China-set saga, Bethune: The Making of a Hero, and this is their first film together for 27 years. Principal photography for the film began in July 2016 in Atlanta, where the crew’s cars were damaged on set by flooding. A casting call for extras was sent out, and filming also took place in Stone Mountain and Dunwoody, Georgia. Other important scenes included Jekyll Island, Georgia, US 1 in Key West and the Hemingway House in Key West, Fla. Fisherman's Hospital is located in Marathon, Florida. The film, based on the novel by Michael Zadoorian, is being sold at Cannes by BAC Films, which will also handle international sales and distribute the film in France, while CAA will co-represent North American rights. On August 30, 2017, Focus Features acquired the UK rights to the film. It was released on March 9, 2018. The Leisure Seeker grossed $3.2 million in the United States and Canada, and $14.6 million in other territories, for a worldwide total of $17.8 million. On review aggregator Rotten Tomatoes, the film holds an approval rating of 36% based on 98 reviews, and an average rating of 5.1/10. The website's critical consensus reads, "The Leisure Seeker certainly doesn't suffer from any shortage of acting talent, but it's largely squandered on a predictable, diffuse drama with little to say." On Metacritic, the film has a weighted average score of 45 out of 100, based on 23 critics, indicating "mixed or average reviews." ^ a b "The Leisure Seeker (2018)". The Numbers. Nash Information Services. Retrieved 20 August 2018. ^ Vivarelli, Nick; Keslassy, Elsa (May 12, 2016). "Cannes: Helen Mirren and Donald Sutherland to Topline Paolo Virzì's 'The Leisure Seeker'". Variety. Penske Business Media. Retrieved March 23, 2018. ^ Jaafar, Ali (May 12, 2016). "Helen Mirren & Donald Sutherland Team For 'The Leisure Seeker' – Cannes". Deadline Hollywood. Penske Business Media. Retrieved March 23, 2018. ^ Anderson, Ariston (July 27, 2017). "Venice Competition Includes Films From George Clooney, Guillermo del Toro, Darren Aronofsky". The Hollywood Reporter. Prometheus Global Media. Retrieved July 27, 2017. ^ Goodfellow, Melanie (May 12, 2016). "Helen Mirren, Donald Sutherland joins Paolo Virzi's 'The Leisure Seeker'". Screen Daily. Screen International. Retrieved March 23, 2018. ^ Busch, Anita (August 28, 2016). "Cars Damaged During 'Leisure Seeker' Shoot In Atlanta: Production Says It Will Pay Deductibles — Update". Deadline Hollywood. Penske Business Media. Retrieved March 23, 2018. ^ Keslassy, Elsa (September 9, 2016). "Bac Nails Sales for Helen Mirren/Donald Sutherland Starrer 'Leisure Seeker' (EXCLUSIVE)". Variety. Penske Business Media. Retrieved March 23, 2018. ^ Keslassy, Elsa (August 30, 2017). "Focus Features Boards 'The Leisure Seeker' With Helen Mirren, Donald Sutherland (EXCLUSIVE)". Variety. Penske Business Media. Retrieved March 23, 2018. ^ "The Leisure Seeker (2018)". Rotten Tomatoes. Fandango. Retrieved 21 June 2018. ^ "The Leisure Seeker Reviews". Metacritic. CBS Interactive. Retrieved 3 April 2018. This page was last edited on 31 March 2019, at 17:53 (UTC).